For this Throwback Thursday post, we went back to a 2005 humor article we published by everyone’s favoritefunny writer, Cooky McClung. If you’re making plans to travel to Ireland to foxhunt for the first time, perhaps I could offer a little advice. As a descendant of a long line of horse-loving County “Kilkenny-ans” privy to priceless stories told by my infamous grandfather, Sean Patrick McMahon, who followed his own hounds into his 90s, as well as my own Irish riding experiences, I have gained valuable insight into the differences between the Gaelic and English foxhunting languages. To begin, don’t be fooled into thinking this is the same kind of ’chasing you’ve been enjoying in Virginia. Or Massachusetts. Or Illinois. Or even Texas, where pursuing coyote provides its own unique brand of excitement. And, should anyone tell you hunting on the Auld Sod is similar to hunting in the States, you’ll want to take note how fast their nose grows. Before accepting a leg-up, first-time foxhunters in Ireland would be well advised to take note of certain disparities in the Irish and American sports. First and foremost, you must understand that while foxhunting may be just a sport in America, in Ireland it is a religion. And, well it should be, since prayer is an integral part of following hounds over there. This, however, in no way requires the Irish to be 100 percent truthful describing their beloved pastime to “furriners,” (anyone born and bred outside what Sean Patrick called “the loveliest island the Lord ever created for horse and hound. )” But, not necessarily for the rider. 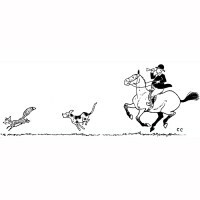 Since uninformed visitors commonly misinterpret Irish “hunt speak,” they are all too frequently left unprepared for the genuine Gaelic foxhunting experience. Following their first outing with an Irish pack, however, which often includes a crash course in the vernacular, visitors quickly learn to refer to the “regional dialect” or “creative colloquialism” of Irish “hunt-speak.” Some, however, once they regain consciousness, simply refer to it as bold-faced prevarication. In its most imaginative form, of course. Hence, before actually mounting up and riding out across the Irish countryside, I sincerely advise visitors to familiarize themselves with the literal Gaelic meaning of a few familiar foxhunting phrases, thus learning to decipher what is meant from what is said. Translation: We’ll be collecting the cap fee up front. Dealing with your estate could prove too complicated. Translation: Give or take 150 post and rails, stone walls, barbed wire pastures, seven-foot banks and ditches that can swallow a horse and rider whole. Translation: He has more miles than an Edsel and moves like a rhino among the gazelles. Translation: You won’t be able to see where you’re going. Ever. But, from the looks of the way you sit, that could be a blessing. Translation: You’ll need a seatbelt at a check. Translation: If she can’t buck you off, she’ll roll over on you. Translation: This horse will kill you. Translation: I will kill you. Translation: If I were a cat, you’d be my hairball. Translation: It looks like a pinata exploded on top of your horse. Translation: As long as it’s wrapped in razor wire. Translation: We “encounter” ditches in our paddocks, and while the forward seat is grand if you enjoy flying, it plays the devil when you’re landing. Weather prediction: “You might take notice there’s a few high clouds in the west. Translation: They’re predicting a monsoon by midday, but we’re staying out till the fox goes to ground if we have to do the backstroke over fences. Any pantywaist who wants to come in early better bring enough rainproof breadcrumbs to find their own way back. Translation: Once, last season, we got back before dark, but that was only because the snow drifted up over our saddles. We carry our cheer in our flasks. Translation: This wall is 5’6″ if it’s an inch. If you’re uncomfortable jumping it you should have stayed in South Carolina. You can get around it if you don’t mind detouring into County Galway. Translation: This ground has as much traction as a luge course. Translation: I don’t know, they were here a minute ago! Translation: Just try not to fall off during a hard run. If you do, please have the courtesy to drag yourself out of the way so as not to impede other riders. Someone will be back to get you. Sooner or later. But, just to be on the safe side, keep your flask with you at all times. Translation: Lean forward, grab mane and hope your nose doesn’t start to bleed before we reach the top. Translation: Or out of an airplane with an umbrella. Translation: I don’t know. They were here a minute ago. And that needs no translation.